Everybody loves soup, right? But you just don’t always have hours to spend making stock, chopping vegetables, and simmering it all together, right? Right! Well, here’s a vegetable soup you can make after you get home from work and have it on the table in well under 45 minutes. 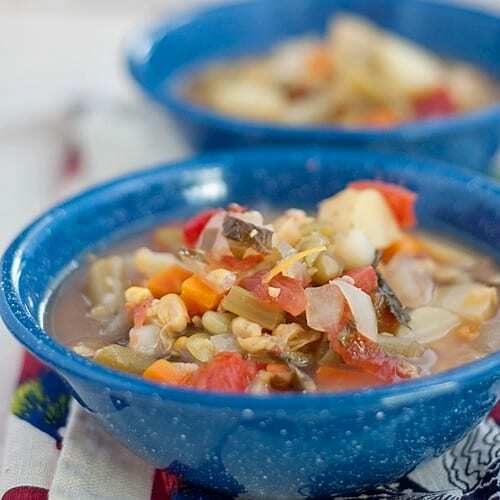 Serve this delicious Vegetable Soup with crackers, cornbread, or biscuits. And I have to say, a peanut butter and jelly sandwich goes really well on the side. Before I get going on the instructions, I wanted to explain what I mean when I list “celery leaves and stems” in the ingredients. When making soups that call for celery, I always use the top portion of the stalks. You know, the little thin stems with the leaves attached? I know most people discard those but, oh my, how much flavor is in those leaves! 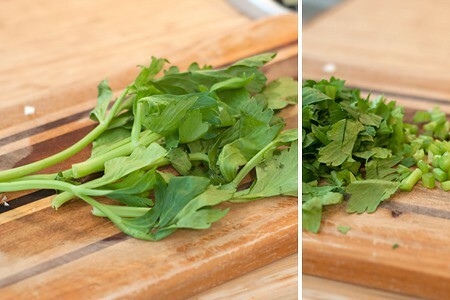 Certainly you can use diced celery stalks here, but those stems and leaves really add a lot to the soup. Give them a try! Also, you can use any kind of potato that you happen to have on hand for this soup. Please don’t run out and buy yellow potatoes just because that’s what I listed in the ingredients. I do prefer a more waxy potato instead of a mealy type, but either works fine! In a large saucepan or soup pot, heat the oil over medium high heat. Add the diced onion and celery and sauté until the onion is just translucent. Add all the remaining ingredients except the creamed corn. Bring to a boil, then reduce the heat to medium and cook, covered, for 25 to 30 minutes or until the potatoes are tender. Please note that you can make this soup strictly vegetarian by using a vegetable broth or you can substitute beef broth if you prefer that taste. It’s up to you. Remove the pot from the heat and stir in the creamed corn. I know you think that’s strange but I learned that little trick a long time ago. I just stir in the can of creamed corn right before serving and, believe me, the soup is so hot that it immediately warms the corn and the creaminess thickens up the soup a little bit. It really doesn’t need any cooking time at all. Serve with biscuits, cornbread, or crackers. 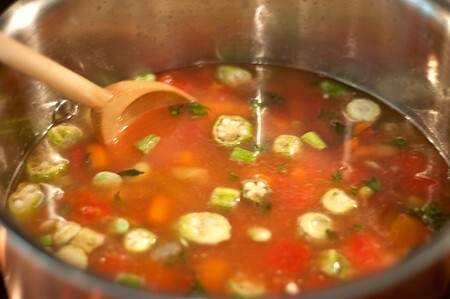 A quick and easy vegetable soup to warm you on the coldest winter day. In a large saucepan or soup pot, heat the oil over medium high heat. 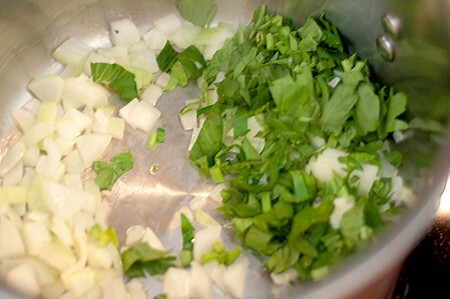 Add the diced onion and celery. Sauté until the onion is barely translucent. Add the remaining ingredients except the creamed corn. 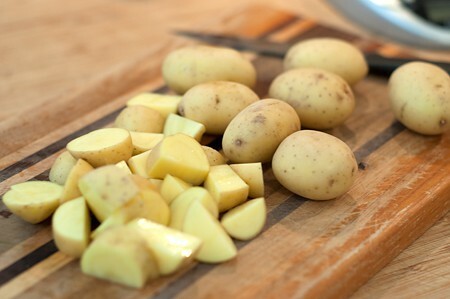 Bring to a boil, then reduce the heat to medium and cook, covered, for 25 to 30 minutes or until the potatoes are tender. 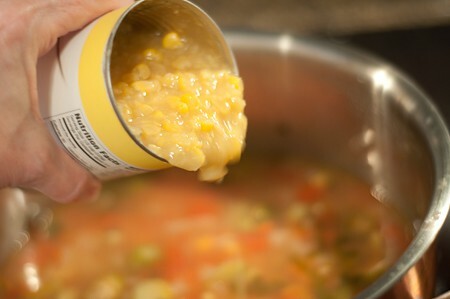 Remove the pot from the heat and stir in the creamed corn. Oh, that looks great. I am so looking forward to cooler weather, when soup and cornbread muffins are making regular repeat appearances around here. We just love a good vegetable soup. Sometimes on weekends, I’ll make a pot of this for lunch and just leave it at a bare simmer on the back of the stove for the afternoon. Whenever one of us feels “snack-ish” we take a little break and grab a cup of this soup. Way better than grabbing a handful of chips or candy! I wish I had this simmering on my stove right now! You can, Sues! It’s easy, easy, easy. Absolutely, Nancy! I substitute whatever I have on hand or need to use up. It’s an especially good way to use leftover veggies.